Hands up if you’ve got a sweet tooth? Same, and this week has been a great one for snack news. Did you know that you can now get your hands on Creme Egg ice creams? Or that the Marks and Spencer salted caramel hot cross buns have made a very welcome comeback? And if you’re more of a savoury foodie, then you need not miss out on the fun. This Marks & Spencer heart-shaped ‘love sausage’ positively screams romance, and is the perfect addition to any Valentine’s Day dinner. Plus, it can be teamed with these heart-shaped Yorkshire puddings for a truly unique February 14th. Now, we’ve got some great news that we know the whole world will be more than a little excited about – Kinder Bueno ice creams not only exist, but they have landed in the UK. This is not a drill. 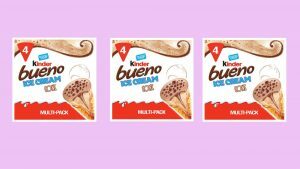 The sweet treat was previously unavailable to Brits but multiple foodie Instagrams have photographed the Kinder Bueno ice creams on the shelves of their local supermarkets. There are currently three Kinder Bueno ice creams retailing – the Kinder Ice Cream Sandwich, the Kinder Ice Cream Stick and the Kinder Bueno Ice Cream Cone. While they all sound absolutely delicious, the cone is definitely causing the most excitement. Made with a hazelnut ice cream, the centre is filled with milk chocolate sauce (yum), the cone is topped with a hazelnut disk and it is then sprinkled with chocolate pieces. The Kinder Bueno ice cream cones are currently available on the Ocado website for £3.50, with multiple Instagram accounts such as NewfoodsUK and Instafoodietwins stating that they’re also available at ASDA. However, they haven’t appeared on the supermarket’s website just yet. Hopefully they’ll start popping up in freezer aisles up and down the country ASAP. The post Kinder Bueno ice creams have landed in the UK appeared first on Marie Claire.